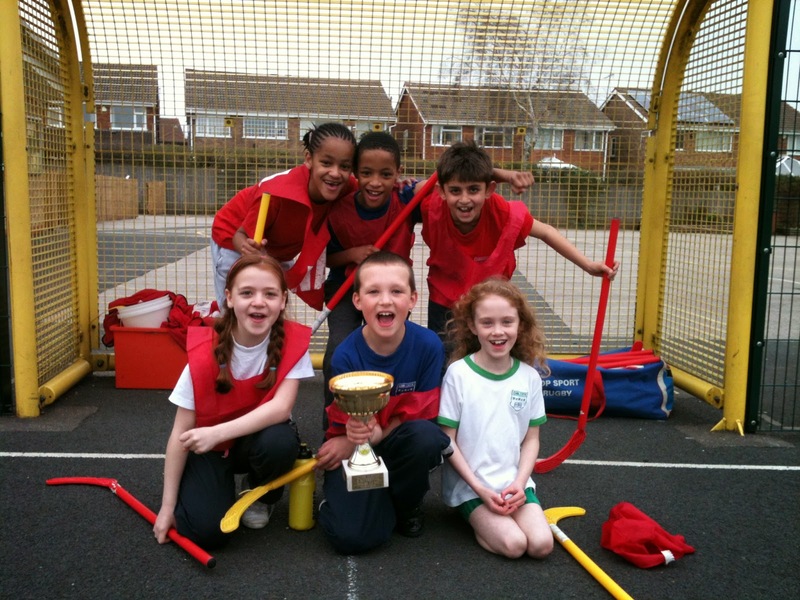 This evening, Chilcote’s Year 4 team emerged victorious in a hockey tournament held at Hollywood School. Well done to Emily, Jessica, Martin, Olivia, Sam and Thomas who all played the same game time and all gave everything. The secret of their success? All six independently practised their skills every break and lunch in the week leading up to the tournament. They aimed high; they won the trophy. 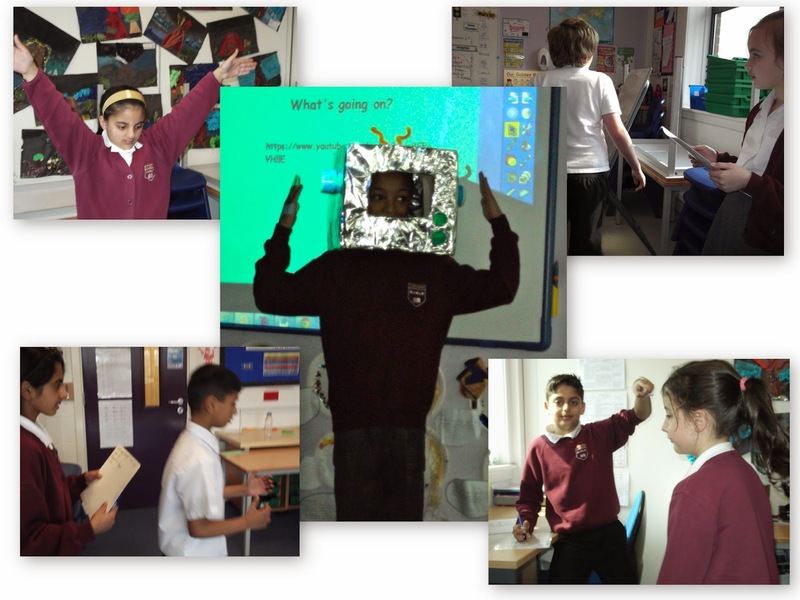 We had great fun this week programming our very own human robots. First, we designed our own programming language. For example, instead of ‘Right’, we wrote RT and for ‘Forward’, we wrote ‘FW’. This saved time when writing our programs. We then wrote our programs, debugging (fixing problems) and thinking of ways to simplify them as we went by using repetition in our sequences. Some of us even moved on to use conditional commands such as IF, THEN and UNTIL. By the end of the lesson, we had completed various coding missions including 'Create a dance routine' and 'Fetch objects and move them'. Year 1 Trip to the Black Country Museum! 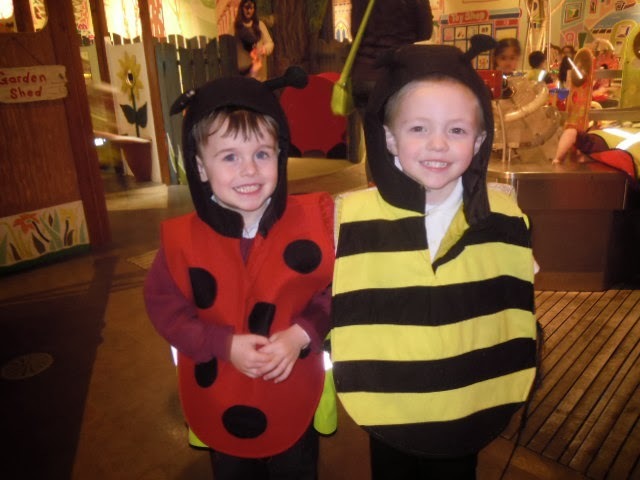 On Friday 21st March, Year 1 went to the Black Country Museum and had a fantastic time! First, we visited an old school and had a lesson from a rather strict teacher. Mrs Jefferies got the cane for being naughty but the rest of us were all really good! Next, we investigated lots of different toys, thinking about whether they were old or new, what material they were made of and who they would have been made for. Then, we went off into our different groups and looked around lots of old shops and houses. We visited an old grocers store, clothes shop, hardware shop and bakers. Also, we looked around old houses and had to decide who might have lived there and why. We were really impressed with the Outdoor toilets and couldn't believe that people used to use them! We had a fantastic time and really enjoyed it! On Friday 24th March the children of Chilcote participated in their very own port Relief day. They had an hour during the day when they did a range of sporting activities. The emphasis was on fun and enjoyment – not competition. The children had a great day and really enjoyed themselves! The children had a go at a range of sports. They: threw a Nerf howler; completed a fitness station; shot a netball/basketball free throw; had a penalty shootout; completed a hockey dribble; played keepie uppies with a tennis ball; bowled at a cricket stump; did a standing long jump. In the afternoon the children completed their very own Sport Relief mile. The children set off with Mr Haycock to complete a mile long course of Chilcote and the surrounding area. All of the children managed to complete it and most of them ran part of the way, which was a good achievement by all! Thank you to all of the children for their excellent behaviour on the day, and for taking part so willingly with all of the activities. Thank you also to all of the staff for their help with the activities and marshalling the Sport Relief mile! 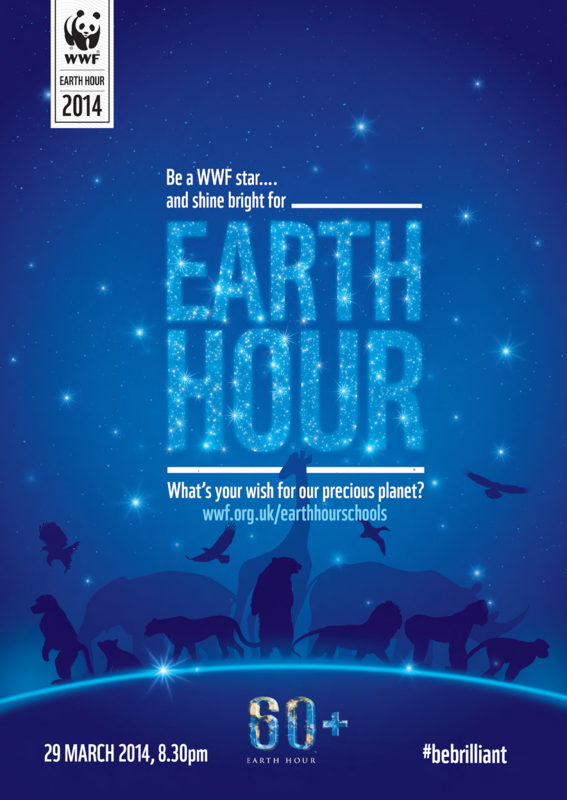 You may already know but Earth Hour is happening on Saturday 29th March at 8:30pm. We are hoping that you will join many people and businesses around the UK by turning your lights off for an hour and take the opportunity to admire the stars which often can't be seen by light pollution (cloud permitting). This is part of a World Wildlife Fund (WWF) initiative which is trying to raise awareness of the beauty of our Earth and the effect that man has on it. The pupils will be having a lesson on the morning of Friday the 28th, where no electrical device or lighting will be on. 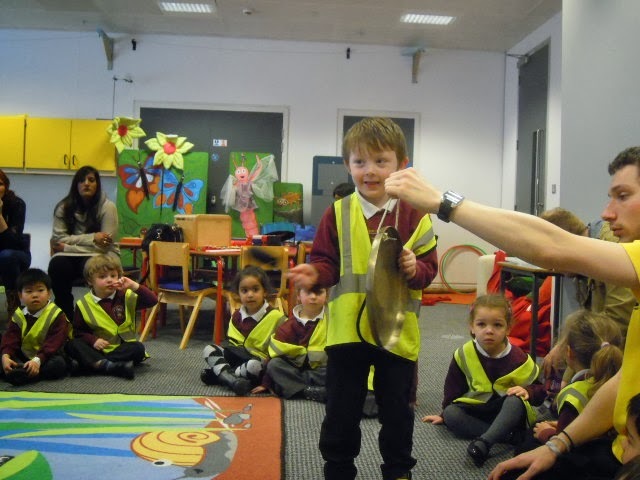 We have had a brilliant science week in Nursery. We have been exploring colour by using coffee filters. We drew a swirly pattern and sprayed it with water to see what would happen. We have also been very busy looking after our caterpillars and tadpoles. All of our caterpillars have now made their cocoons and are hanging in our butterfly house ready to turn into butterflies! In PE on Thursday we learnt Irish Dancing with Mrs Schreier and her son; it was great fun! Next week: we will be getting ready for Mothers' Day and talking about how we can help our Mums. We will be making and writing cards, as well as exploring the book 'Nigel's Numberless World', ready for our Inspire parent workshop on Wednesday. To support Sports Relief the Reception children went outside for a fun hour of different sporting activities such as the long jump, hockey, tennis, cricket and throwing the rocket whistler. The children had a fantastic time, developing new skills and learning to work as a team. The children have really enjoyed their active day and are now ready for a restful weekend. Just a reminder that it is our trip to the Sea Life Centre on Thursday 27th March. Please arrive at the school normal time, with the children wearing their school uniform, a coat and sensible shoes. Also, don't forget a packed lunch. It will be a brilliant day! We have been reading a Roald Dahl book for World Book Day. I like the part when the Grandma shouted the chicken is on fire and I liked the bit when Grandma had smoke coming out of her mouth! J I also liked the part when the dad was ignoring the Grandma and was amazed by the chicken. I thought it was funny when the chicken’s legs were very long and all the rest of its body stayed the same size as it was before. We spent the day designing, making and testing our own balloon cars. First, we discussed the science behind the balloon cars (forces) and the different elements that we needed to consider in order for our balloon cars to travel the furthest. We then drew two different designs for our balloon cars models taking into consideration the different materials that were available to us. After this, we got into groups of 3 or 4 and chose a final design by analysing all the individual designs. We then drew this design. Once we had finished drawing our final design, we started constructing the balloon cars with the materials stated on the drawing. After, break time we took our cars outside to test how far they travelled on a mapped out track. When testing our balloon cars and watching other peoples cars, we analysed what improvements could be made to the cars in order to make them travel further (mass, axles, streamlined). We then improved the model of our balloon cars and then went back outside to test them to analyse whether they had travelled further than the first test. On Friday 14th March the 7 a-side team played their second match of league one. After the victory in their first game they went into it full of confidence. Their opponents were St Bernard's School. Chilcote started the match really brightly and forced a few early chances. After 10 minutes they were awarded a penalty for handball. Unfortunately, the spot kick was saved in style by the St Bernard's goalkeeper, which kept the score at 0v0. This woke St Bernard's up and they started to play some lovely football, but yet again they couldn't find a way past the Chilcote defence. Dylan, Ammaar and James stopped everything! The game reached half time at 0v0. Chilcote again started the second half brightly, and pressed to get the opening goal, but they couldn't find a way past the St Bernard's goalkeeper, who pulled off one of the best saves ever seen at Yardley Wood, fantastic reflexes! Again, St Bernard's came back into the game and dominated possession, with Chilcote hitting them on the break. Both teams tried but failed to get the goal that they wanted. The game ended 0v0, which on the balance of play was a fair result. Well done on another solid performance boys! The next game is against arch rivals Hollywood on Friday 21st March, come on Chilcote! On Wednesday 12th March the Chilcote 9 a-side team played Harbourne School in the HMS Cup quarter final. The game was a closely contested affair with both teams playing really well. Halfway through the first half Chilcote went ahead thanks to a screamer from the left winger, Harry, who struck a half volley from outside the area straight into the top corner. After that, Harbourne started to pile on the pressure, and unfortunately just before the break they equalised with another great goal, again scored from outside the area. In the second half Harbourne went searching for the winning goal but couldn't break down the stubborn Chilcote defence, and the game ended 1v1. This meant extra time, which carried on in the same way as the second half with Harbourne attacking and Chilcote hitting them on the break. The game ended 1v1 after extra time, which led to penalties. Both teams chose three penalty takers. The first two from each school scored, then the third Harbourne penalty taker had his penalty saved by Matthew, before Ammaar smashed home the winning penalty. Chilcote are now in the semi-finals and are playing St Lawrence, if they win they will be gracing the hallowed turf of Bodymooor Heath for the Final! Well done boys another great victory! 1. Floating floors – we saw how air (a gas) fills shapes when we created a platform out of balloons and cardboard. We predicted the balloons would burst, but even one balloon supported the weight of one person, until the rubber split under the pressure! 2. 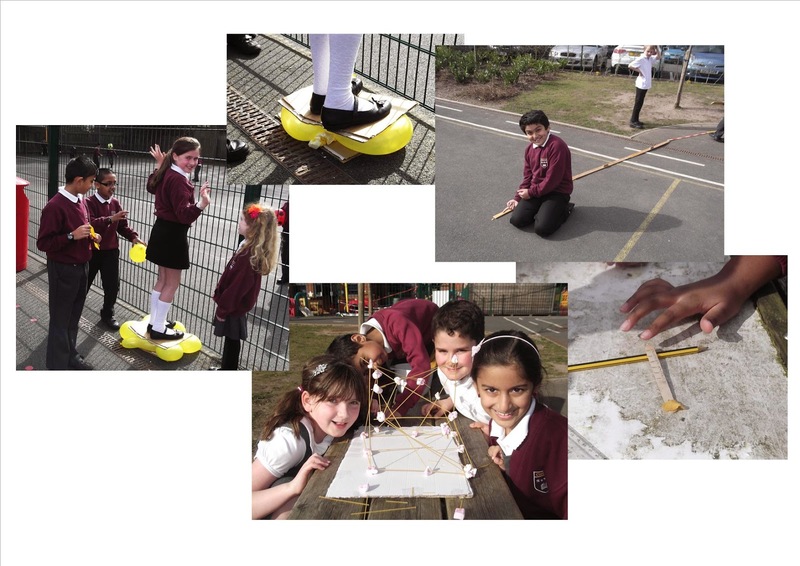 Flying cornflakes – by the end, we understood all about levers and fulcrums by firing cornflakes up to an incredible 4m, 16cm! 3. Spaghetti Towers – in groups, we attempted to construct the tallest tower we could using only dried spaghetti and marshmallows. We thought the towers could have been bigger if the sun hadn’t have melted the marshmallows! Next, we carried out a rocket balloon experiment. It was very exciting! We found out that a larger balloon would travel further along the string and a smaller balloon would travel a shorter distance. We talked about a forward motion called thrust. Thrust is a pushing force created by energy. Today was a sad day in Reception as we had to say goodbye to the chicks. We have had them for a week but they have now sadly grown too big, therefore they have gone to very good homes and we know they will be well looked after. During the week we have looked at the life cycle of a chick and have done some fantastic writing about them. We have also been keeping a chick diary, tracking the progress that they have made during their stay in Ash/Oak. We will miss the chicks greatly. We have been learning about the life cycle of a butterfly this week through the story 'The Very Hungry Caterpillar'. We had an exciting delivery of some real life caterpillars that we will be looking after until they turn into butterflies! We have enjoyed sorting and counting the caterpillars' food, singing about the tiny caterpillars and making our own versions to take home. We have also said goodbye to the chicks in Reception, and Mrs Scott has given us some frogspawn from her pond! We will be looking closely at it to observe any changes that happen! Next week: we will be exploring the life cycle of a frog, and recording messages in ICT to welcome the caterpillars and tadpoles to our Nursery. On Friday we will be getting sporty for Sports Relief and joining in with lots of relay races and jumping games. Year 6 P.E. Gymnastics Topic! Over the past half term, we have been working on some amazing paired gymnastic sequences, which we filmed over the last 2 weeks. We performed in pairs and were shown how to put up all the apparatus, which included: the benches, climbing frame, mats, the tables –not dinner tables - and the dinosaur (named after its shape). Each week we were timed when setting the equipment up, but this also had to be done safely so time was added for any dangerous behaviour. This would also happen if the equipment was unstable or insecure! Our fastest time was 3:45 for all of the equipment to be set out!! Everybody had a performance check list and they had to do as much as they could to develop the best sequence possible. There were some things that only people on certain equipment could do – such as: roles, jumps and balances. However some features were achievable on all of the equipment, for example: mirroring and synchronisation. All in all it was a great topic, despite some great challenges, but the sequences were amazing and thoroughly enjoyable. Hopefully you’ll be able to watch one of the sequences attached to this blog!! Thanks, Karim in Year 6. Thank you to the many parents who supported tonight's E-Safety for Parents evening. Here are a few practical resources to help protect your child online. http://www.internetsafetycheatsheet.com is a fantastic site offering practical advice on the sites we know are very popular with our children at Chilcote when they are online outside of school. Select the drop down menu CLICK HERE FOR CHEAT SHEETS for videos and easy to follow guides on how to create settings on Google; Instagram; iPhone and iPad; Minecraft; NetFlix; Vevo and YouTube. http://www.internetsafetycheatsheet.com/opendns/ explains about filtering settings on your home router: OpenDNS is a free service you can set up to block inappropriate websites on every device that connects to your wireless network (including mobile devices). If you want the ability to track time spent on specific websites (gaming sites, Facebook etc. ), you can get their VIP plan for $20 a year. Finally, from the responses to our E-Safety for Parents questionnaire it was clear that many parents are concerned about their children accidentally accessing inappropriate material through search engines. http://www.internetsafetycheatsheet.com/search-engines-for-kids/ offers alternatives to search engines which can inadvertently lead children to inappropriate material. You will have received an email from the school office with a link to the questionnaire. If you get two minutes, please would you consider responding as it gives you the chance to air your views and helps us to tailor your child's E-Safety curriculum. On Friday 7th March 2014 the year 6 boys’ football team played their first match in division 1. It was a tough fixture against Severn. They had beaten the boys once already this year. The match started with some good chances for both teams. Then on a swift counter attack, Ayden (Chilcote’s striker), skinned his defender before sprinting clear and thumping the ball past the goalkeeper in a one-on-one. The half time score was 1v0 to Chilcote. After the break the two teams again had chances, although more of the chances fell to Chilcote. Midway through the half Harry hit a left foot shot from outside the area which flew into the bottom corner, again after good work from Ayden upfront. Severn pressed at the end to try to get a goal back, but the Dylan and Ammaar wall stopped them. The game finished 2v0 to Chilcote, which was a fantastic result for the boys! Well done! This was the best performance of season, and everybody in the team did their job excellently! On Friday we took the children to Birmingham's Central Library as part of World Book Day. The children got to look round the library and choose some books from the children's section if they wanted to. A member of the public has contacted our school to say how impressed she was with the way children quietly and calmly moved round the library and how 'they are a credit to the school', well done Year 3! In the summer term Year 3 are hoping to make weekly visits to the Yardley Wood library to encourage more reading. What a busy week we've had in Nursery! On Tuesday, we learnt how to mix ingredients to make pancakes and enjoyed eating what we'd made at snack time! Then, on Thursday we had great fun dressing up as different characters from our favourite books. Year 3 came to visit us and read us a story which we really enjoyed. To finish the week, we got on a coach and headed off to the Think Tank Science Museum! We had such a brillliant day, and loved exploring the 'Kids City' role play area, as well as the Science Garden. 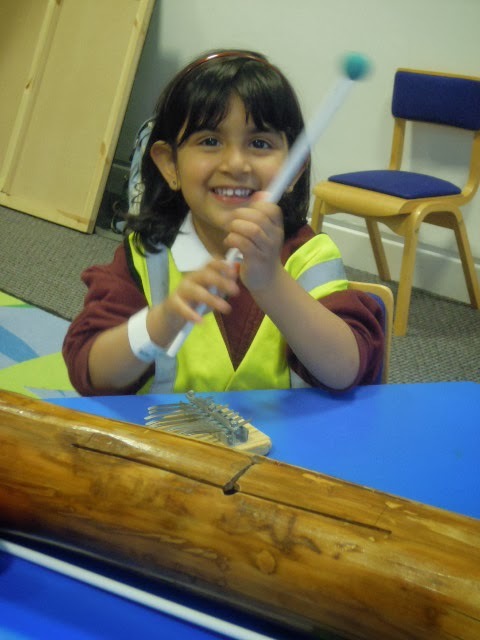 We also took part in a work shop where we all got to be special 'Sound Explorers'. We loved making lots of noise! Next week: we will be writing about our favourite part of the trip, and starting to think about 'New Beginnings' as we start our new caterpillar topic. We will be exploring 'The Very Hungry Caterpillar' by Eric Carle. Year 2's Visit from the Amazing Animal Man!